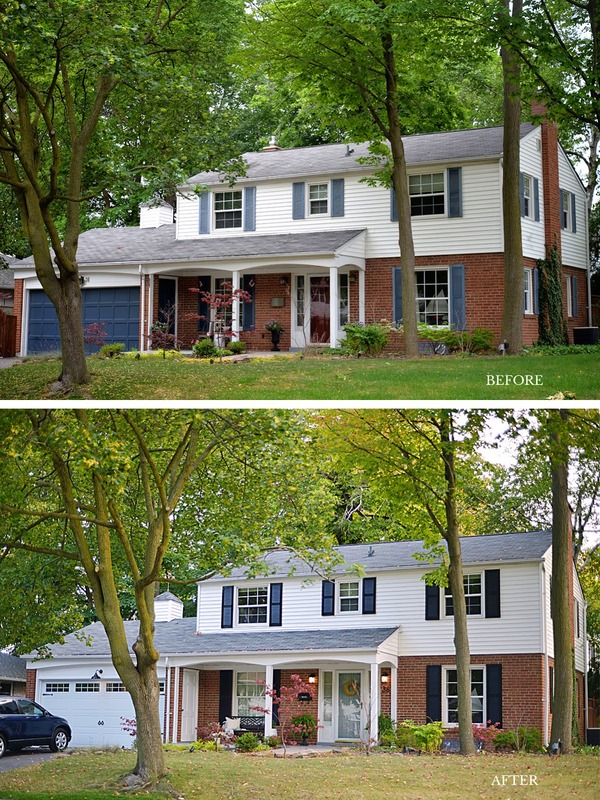 We've been updating our home's exterior throughout the summer and I'm excited to show you some final changes. 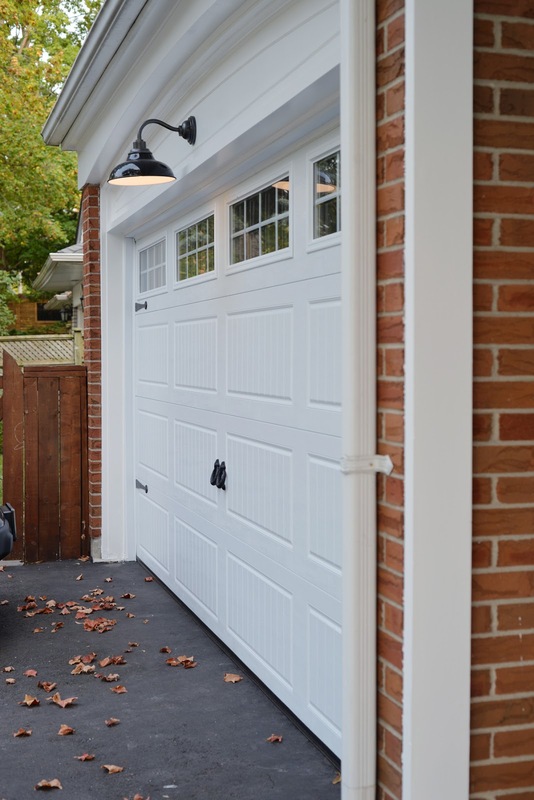 I've shown you the new carriage style garage door from Garaga and the outdoor lighting. Just those two permanent changes really increased our curb appeal. In the summer months, the front porch is my favourite place to sit outside. Can anyone resist the appeal of a porch? At our old house, our back porch with built-in L-shaped banquette was my summer office. Working was so much easier with the sounds of the birds and bees to listen to. And our cottage porch is the ultimate summer hang out spot. 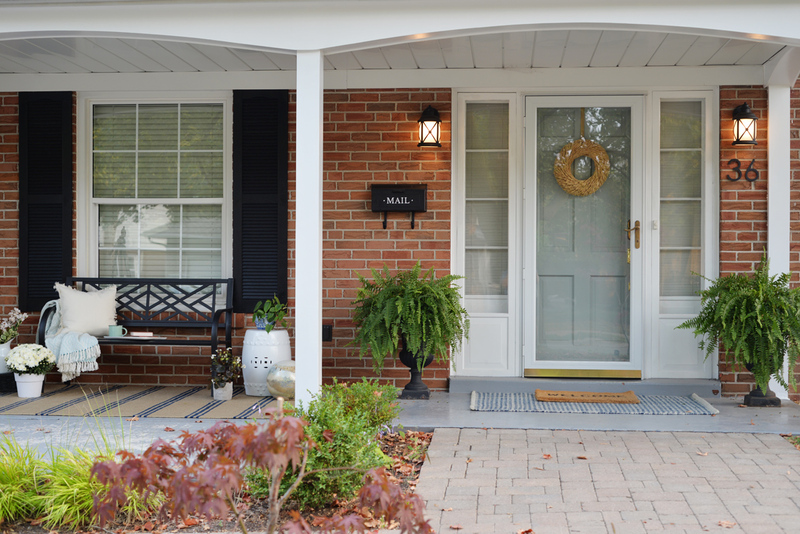 You don't need to make significant and costly changes to have your porch ready for the season. 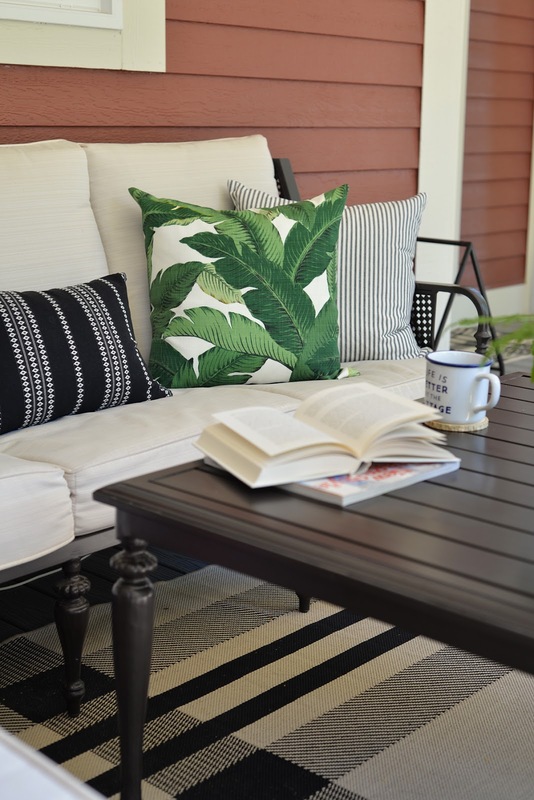 Whether you have a small front porch or a more expansive one, you can make this outdoor space inviting. 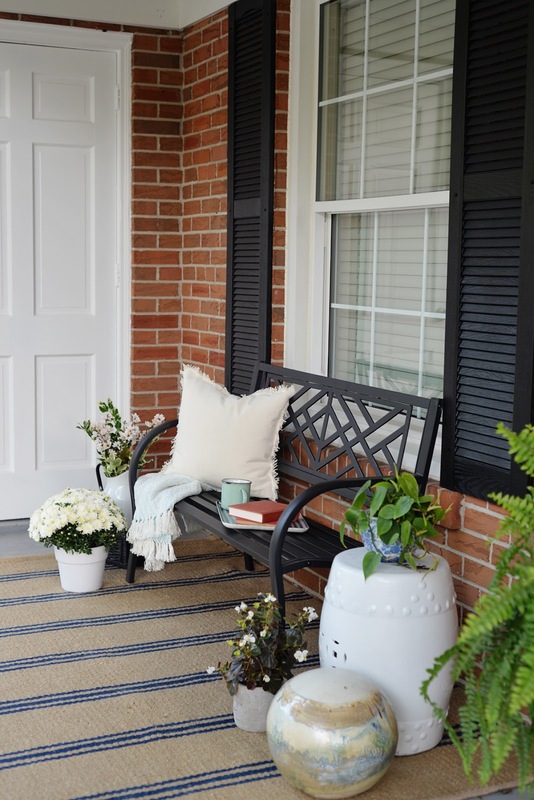 Here are some of my front porch decorating ideas and quick and simple ways to enhance your home's exterior. 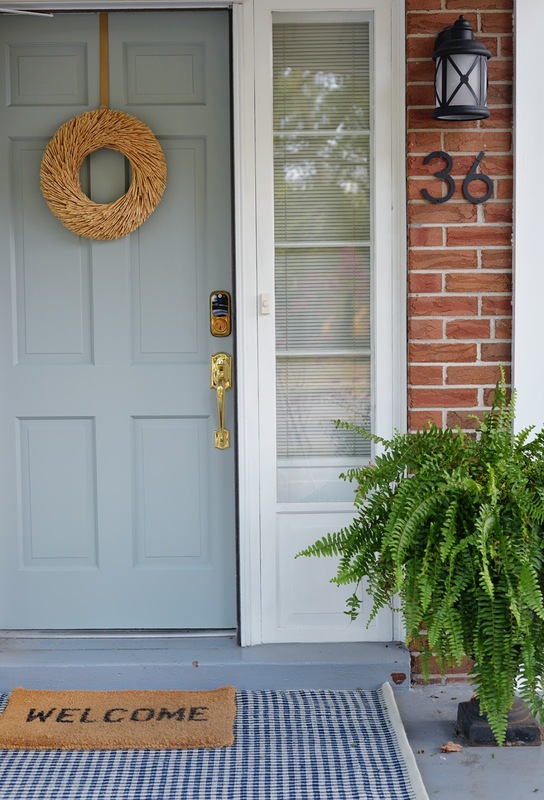 To really give our exterior a new look, I wanted to paint the front door. Our old cranberry red door worked with the red tones of the brick but I felt it blended in too much. I craved something lighter and brighter and more noticeable from the street. We settled on Wormwood by Sherwin Williams. It's a mid-tone grey-green colour. We didn't want anything too dark (our last home had a black door and we wanted a change) and nothing too blue (we just got rid of the blue garage door). I did love emerald and olive green colours, but felt my seasonal green wreaths would blend in with those colours too much. The Wormwood is a nice, neutral colour. It makes the blue-grey porch floor seem a little cool but we're planning to repaint that at some point anyway. You can see here that we repainted the old blue shutters a true black colour as well. We used Krylon Fusion for Plastic in Satin Black which has a bit of a sheen. How do you repaint shutters? For the ground floor windows where the shutters are screwed into the brick, Sean masked off the area with paper and spray painted the shutters installed. The shutters on the second floor were easier to repaint by first removing them from the siding, then spray paint and reattach them. I'm surprised how repainting the shutters makes them look physically bigger and brand new. With the door painted, we could finally move onto decorating the porch. One of the most important elements was adding rugs. 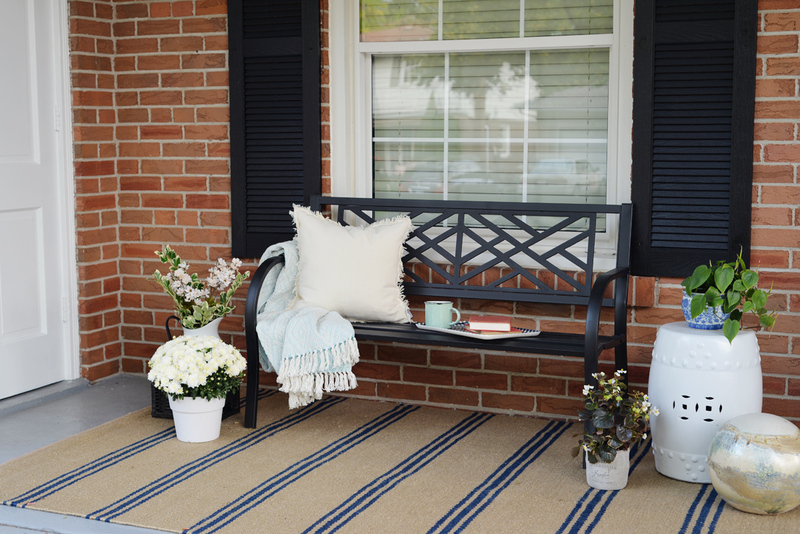 The porch is rather long and rugs would help define the sitting area and the entry door. When it came to finding outdoor rugs that combine durability and style, I knew Annie Selke would have what I needed. I had worked with the Annie Selke team previously on our One Room Challenge living room and I'm a big fan of their selection of rugs. Colour-wise, I wanted rugs with warm tones to balance the coolness of the porch floor. For the sitting area, I went with the Lexington Navy/Camel Indoor/Outdoor rug. The camel colour paired with the navy stripes is just my style. I like that this pattern is neutral and can work well in any season. And it feels so soft! If you hadn't told me this was an outdoor rug, I wouldn't have believed you. It's actually made of PET, a polyester fiber made from recycled plastic bottles. We don't get too much dirt up on our porch, just a few stray leaves, but I wanted a rug that will stand up to the elements and sunlight spring to fall (I'll take the rug in for winter). At the front door, I jumped on the trendy layered rug look. 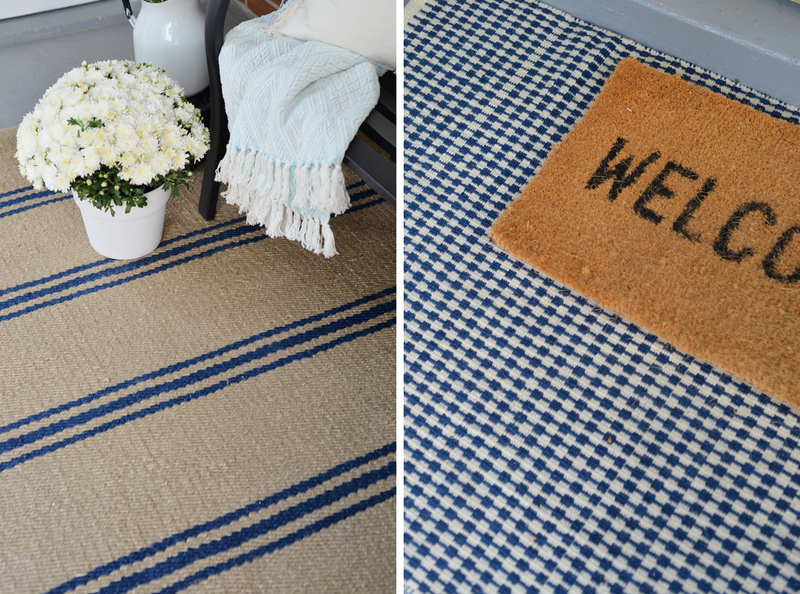 I used the coir Welcome mat I already had and layered it on top of the larger McGregor Navy Indoor/Outdoor rug. The rug has a sort of modern houndstooth pattern which feels preppy and gives you an indication of the style that runs throughout our home. Here's another decorating detail I haven't yet shown you: the barn light over our garage door. I've had my eye on the Carson Wall Sconce for a very very long time and couldn't wait to put one over our new garage door. It casts a really beautiful downward light and the gloss black looks sharp against the white trim and door. 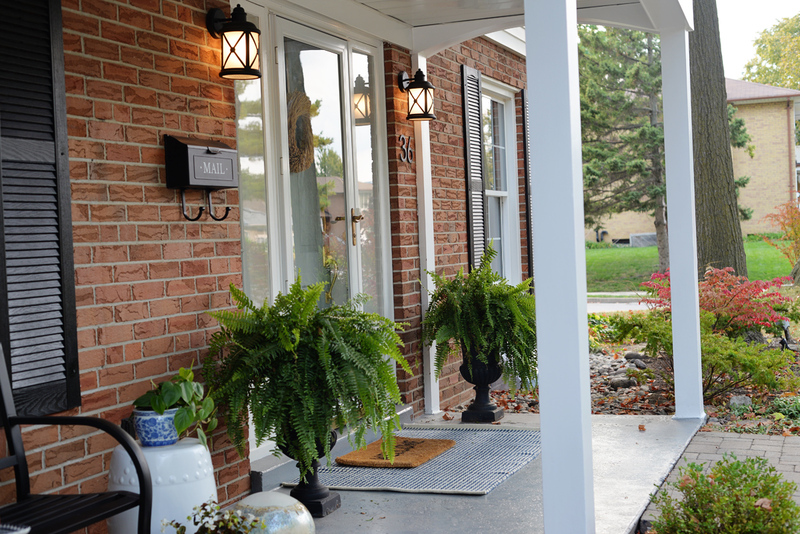 Speaking of light, the outdoor lanterns we chose are bright and beautiful. Dim lighting is a pet peeve of mine so I'm really glad these ones cast significant light. 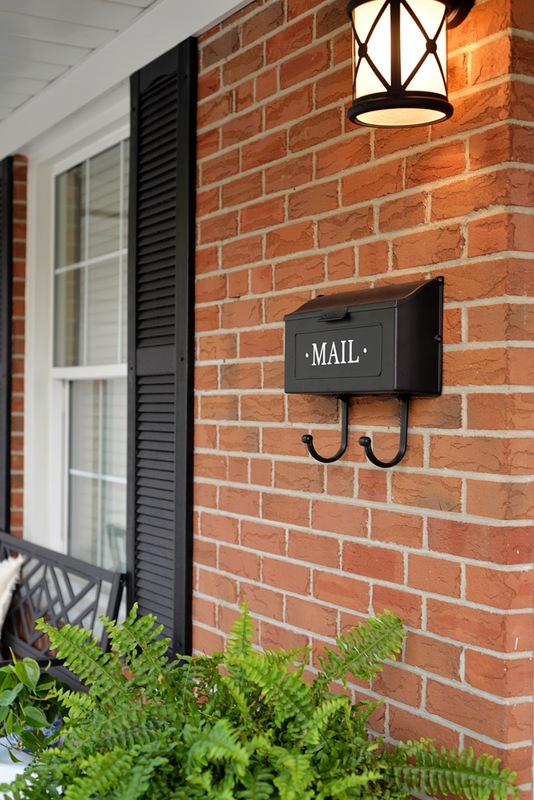 They also highlight our classic mailbox to which I've added a fun "Mail" decal I made on my Cricut machine. Long-time readers might remember we had a similar decal on the cool mailbox at our old house. 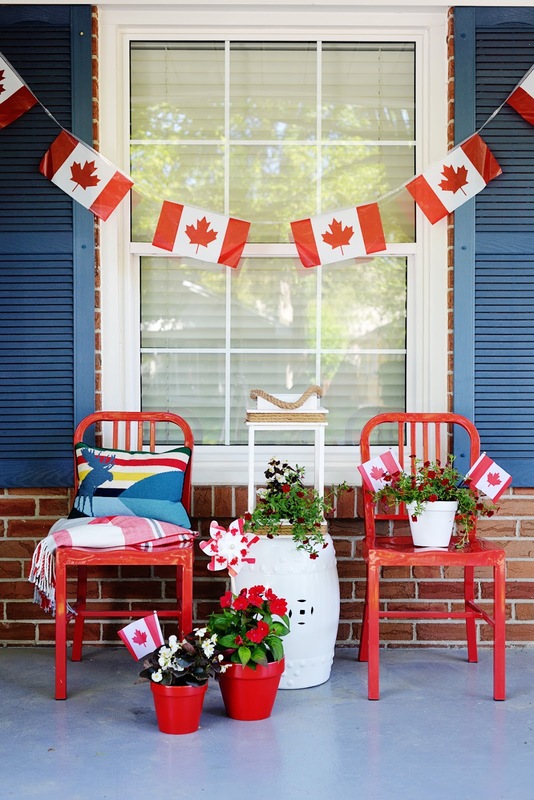 You don't need to go overboard with your porch decor. I've decorated the porch for late summer with just a few plants, branches cut from the garden, a garden sculpture, and ceramic stool. 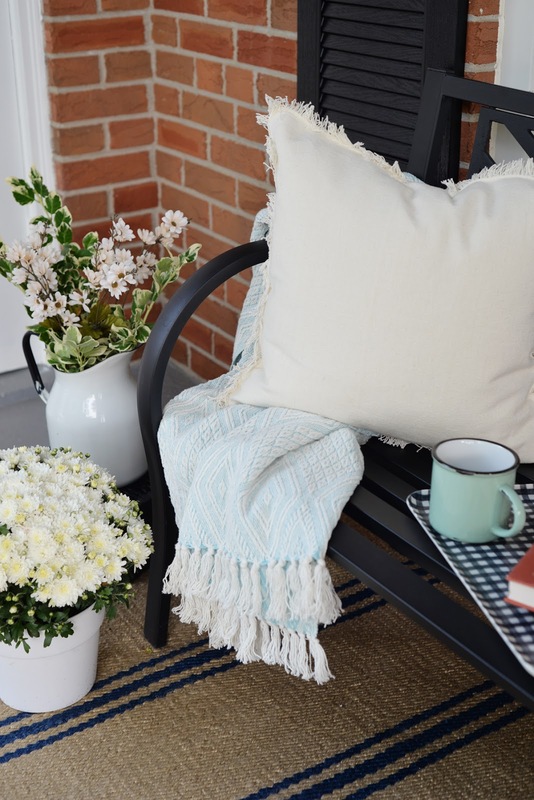 The tasseled throw and cushion came courtesy of Sarah Richardson and the team at HGTV Canada in promotion of Sarah's new show, Sarah Off The Grid. Have you been watching? I'm addicted! It has everything I love - Sarah's enviable style, Sarah + Tommy, a bucolic country setting. In case you missed the first episode, or can't watch it from the US, my friend Tim at Design Maze shares weekly recaps of the show with all the design details you need. 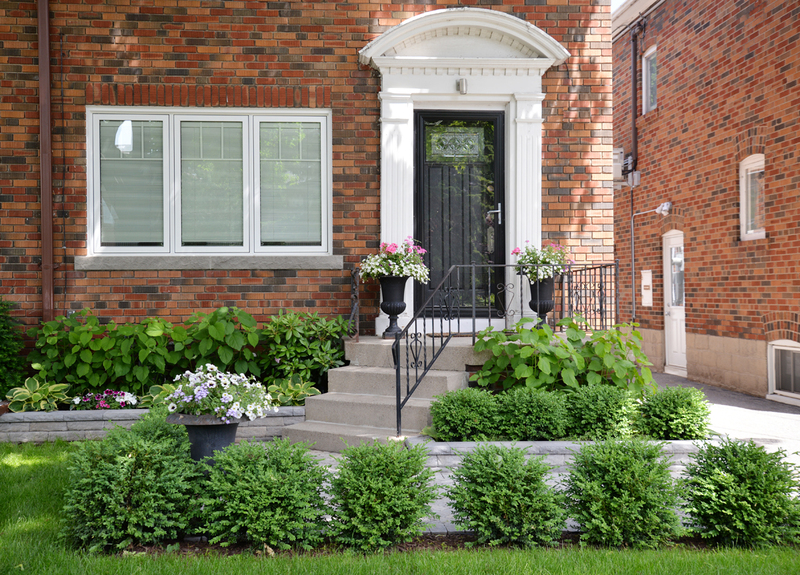 I've always loved the look of a pair of traditional urns or planters flanking the front door. 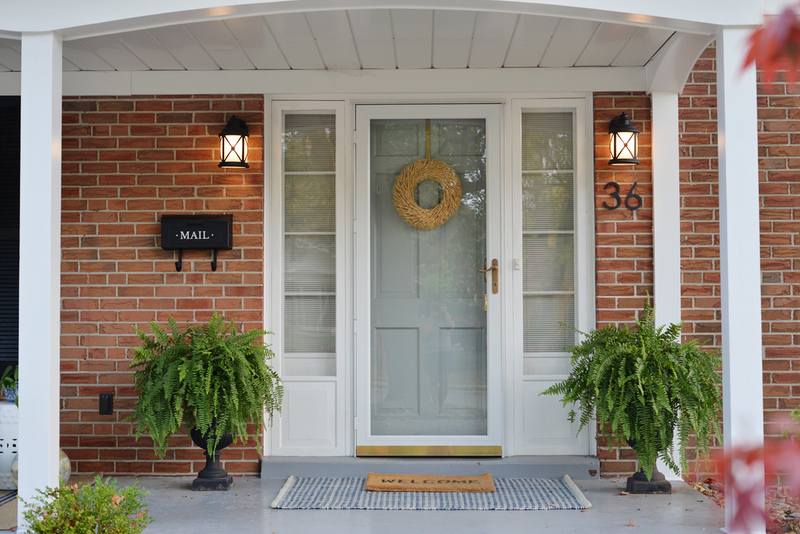 They provide a sense of symmetry and emphasize your door as a focal point. Filled with leafy ferns, these planters also add texture and bright colour. It might have taken all summer, but our home's exterior is finally feeling refreshed and renewed. There's still more to be done - reworking of the landscape and walkway, painting the porch, replacing the siding - but that will have to wait for next year. Now, I just have to grab some pumpkins and make this porch ready for fall!